Welcome to the Easter creations celebration with the Creation Station design team! This tour we’re all about sharing our projects for Easter using a really cute stamp set called For Peeps Sake, and showing off some beautiful blooms with the Sale-a-bration stamp set Lotus Blossom. You still have 16 days before Sale-a-bration ends, to get your set for free! If this is your first time joining us, it’s very easy for you to enjoy all of the projects; all of our blogs are linked in a circle, so as long as you keep going the same direction, you’ll be taken through each blog, and you’ll see all the fabulous projects we have in store for you. I wanted to use this set a little differently, so I decided to incorporate the blossoms into a wreath! I stamped the wreath shaped background onto Whisper White cardstock, using the Wondrous Wreath set, which was carried over from the Holiday catalogue. I used just the leaf stamp, stamped twice using Old Olive ink, to fill it in a bit more, and then stamped the berry stamp using Rich Razzleberry ink. I stamped the Lotus Blossom flowers 4 times onto Whisper White cardstock, and cut them by hand. The ink colours I used in stamping were Blackberry Bliss, Perfect Plum (stamped off once) and Wisteria Wonder. After cutting them out, layered them on top of the wreath outline using Stampin’ Dimensionals. 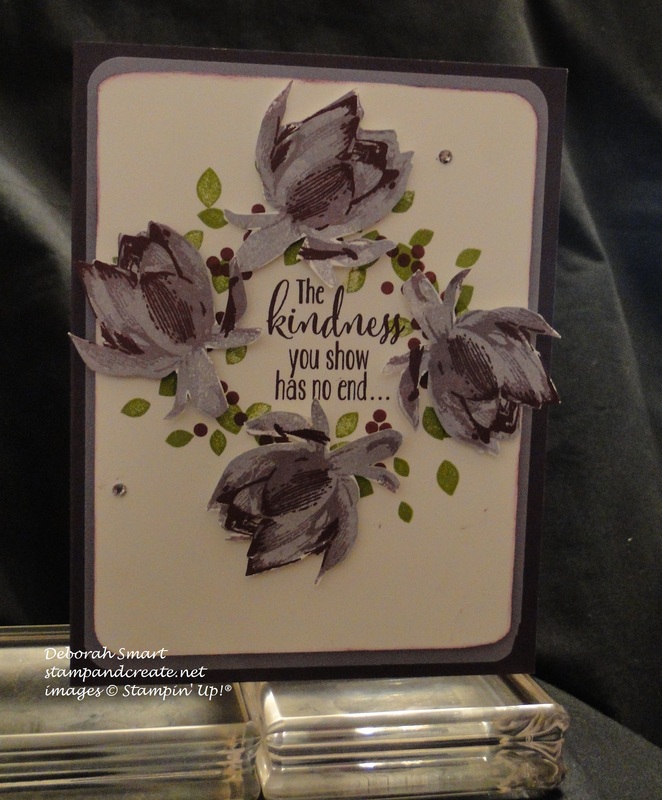 The Whisper White layer was attached to a layer of Wisteria Wonder cardstock, which was then layered onto the card base of Perfect Plum cardstock. You can’t really tell in the photo, but I had coloured the Rhinestones using the Blackberry Bliss marker. The sentiment, stamped in the middle of the wreath in Blackberry Bliss ink, I think suits the symbolism of the wreath, in kindness having no end. My next project is all about Easter fun – featuring For Peeps Sake! I was torn between using the Happy Hoppy Easter sentiment, or using You Crack Me Up! sentiment – both in this set. You can see what I decided upon. My card base is Whisper White cardstock; the bottom 1/2 is covered with Old Olive cardstock that I cut using my Fringe Scissors to look like grass. For the top 1/2, I used the new Sheer Perfection Designer Vellum Stack – one of the new selections for Sale-a-bration. Did I mention that you have 16 days to earn your free products?! 😉 There’s a great variety of patterns in this stack that contains 24 sheets. I coloured on the back of the vellum using my Stampin’ Write Markers in Coastal Cabana and Blushing Bride, then used a Sponge Dauber and Soft Sky ink to add some colour above the flowers. I attached the ‘grass’ and vellum panels to the base using Stampin’ Dimensionals. To stamp the cute little chicks, I wanted to incorporate colours, so I again used my Markers (these things are da bomb, ya know?!) directly onto the stamp, then stamped onto Whisper White cardstock, and used the Chalk Talk Framelits dies and my Big Shot to cut them out. I coloured the little eggs the same way, but used my Paper Snips to cut them out, and hid them amongst the grass with just 1/2 a dimensional for each one. I added some Candy Dots along the bottom to tie in the blue colours, and my card was done! I have one more Easter project to share with you; I know that a lot of other people have already done these, but I really wanted to make one, myself! 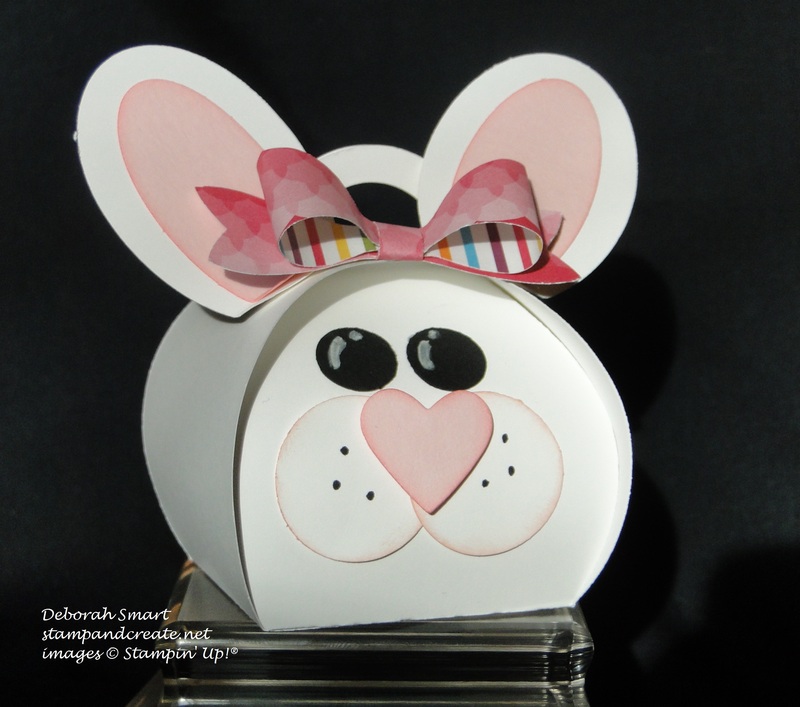 I just love bunnies, and using the Curvy Keepsake Box Die made it super easy to make this one! Before putting the 2 pieces of the box together, I first punched out the pieces and assembled the bunny’s face. I used the following punches: eyes: 1/2″ Circle punch; cheeks: 1″ Circle punch; nose: Hearts Framelits Die (smallest); ears: Small Oval and Large Oval punches. For cardstock I used Whisper White, Basic Black and Blushing Bride; I used my Basic Black Marker to draw on the dots, and the Chalk Marker to make the highlights in the eyes. After gluing on the pieces for the face, I assembled and closed the box. I then attached the ears using Glue Dots. I used the Bow Builder Punch and Sweet Taffy Designer Series paper to make the bow, and attached it between the ears, again using Glue Dots. 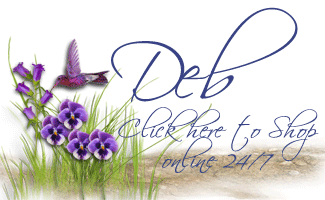 Thank you for visiting – now I’m going to hand you over to either Jen Arkfeld, if you’re traveling forward – just click on the ‘Next’ button below, or to Jennifer if you prefer to click the ‘Back’ button. Either way – you’re on your way to some more great projects! Previous Previous post: Classes, Hops & Parties – What Fun! 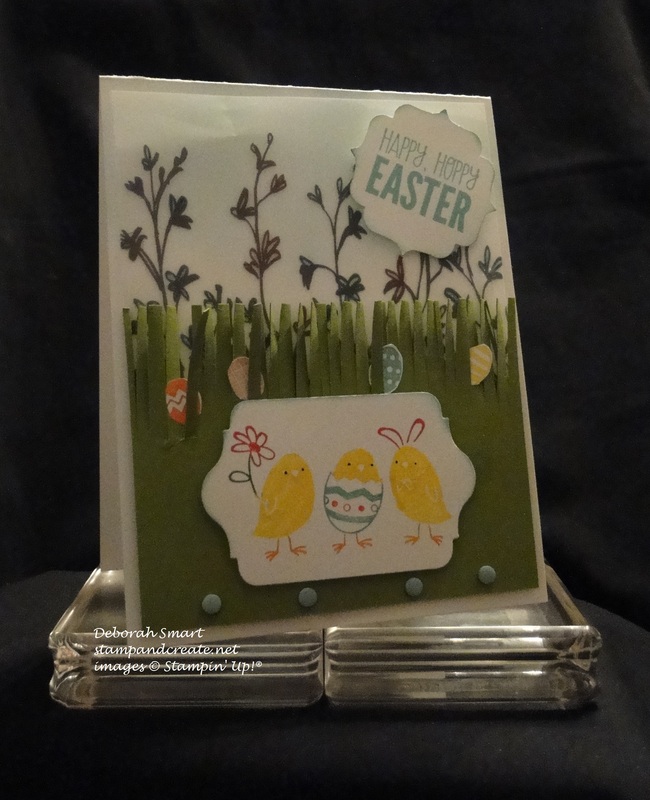 I love your “For Peeps Sake” card with the Easter eggs peaking out of the grass–so cute!! And what a smart idea (see what I did there?) to use the “Wondrous Wreath” set with the “Lotus Blossom.” Awesomesauce!! LOL! Yeah, I see what you did there, Kathy! 🙂 Thanks for your nice comment – you made me smile! What a cute way to use the Sheer Perfection Vellum! Oh that bunny basket is just the cutest!! Thanks for your comment, Jenn! I’m glad you liked the bunny box 🙂 I just saw someone else put the bow at the bottom, like a bow tie; that would be cute for boy & girl bunnies! Love your bunny! Just got the bow punch so I’m going to try one right now! Thanks for sharing your talents! Thanks, Bonnie – so glad you like my bunny 🙂 You’ll love the bow builder punch – it’s so easy to use. Have fun stamping & punching! Love this bunny box, perfect for spring projects!